Meal planning is #1 way that I save money on groceries. Without a doubt, the 30-60 minutes I spend on Sunday planning our upcoming week’s meals saves me time, money and my sanity. And since the grocery budget is the easiest category to reduce, I am diligent every weekend to plan our meals for the upcoming week. I like to try at least one new recipe each week and Pinterest is the only search engine I really use for recipes. (I don’t even bother Googling to search for recipes anymore.) If I see pork chops on sale at the store, I’ll search “pork chop recipes” on Pinterest for new ideas. In the past, when I found a recipe on Pinterest that I wanted to try I would re-pin it to one of my boards. But I was forgetting what I had pinned and where and if I didn’t like something, I didn’t want it on my boards, so I created a new board titled, Dinner This Week. I now pin a recipe that I plan on trying to that board. And I only pin the recipe if I absolutely plan on trying it, otherwise I have stopped randomly pinning recipes that I will NEVER get around to, because my boards were getting ridiculous. If we like the recipe, I re-pin it to one of my main boards, but if we don’t like the recipe, I delete the pin. This simple trick is saving me so much time. When dinner prep time rolls around, I log on to Pinterest and find the pin on my Dinner This Week board and click over to the recipe. Seriously, what did we do before Pinterest! Do you need to reduce your grocery spending? Read 11 Simple Meal Planning Tips for my strategy. Great tips and advice! 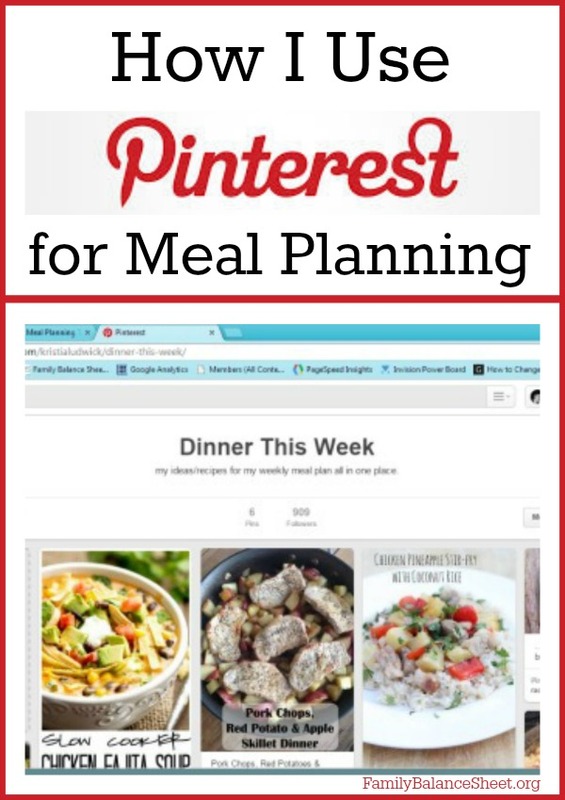 I just recently reorganized my Pinterest board to make it more useful in planning meals. I had one category-Food and I was putting everything from cupcakes to cooking tips to salads to meatballs in it. I now have separate categories to quickly find a main course and side dish for dinner. I had been on a roll with new recipes. I was 3 for 3 until last night…part of the meal worked so we were not at a complete loss. I am stopping by from Thrifty Thursday link party. I had a meal like that last week. I had to improvise with some leftovers to save dinner! Thanks for stopping by and taking the time to comment. I’ve been doing this for a year now, as I got tired of buying ingredients (sometimes expensive ones) and forgetting what I was going to make with them! It also comes in handy when I’m running late getting home from work and I can tell my husband to go on Pinterest (i taught him how ti find the board) and get dinner started for us! Pinterest is such a handy tool. And I love that you taught your husband how to use it. Thanks for stopping by and commenting.